The National Committee to Protect Shipping, Roads and Railways (NCPSRR) has revealed that the number of road accidents and casualties increased in 2017 compared to 2016. The fatal accidents took place on several highways and national, inter-district and regional roads across the country between January 1 and December 31. The non-government organisation NCPSRR, on Monday revealed the information in its yearly survey and observation report 2017. The report was prepared on the basis of news published in 22 national dailies, 10 regional newspapers and eight online news portals and news agencies, the release said. The report showed a total of 3,412 people, including 470 women and 453 children, died and 8,572 others injured in 2,998 road accidents in 2016. The report shows that the number of road accidents increased by 474 in 2017 than 2016 while the number of death by 872. As a result, the number of accidents increased by 15.82 percent and death toll by 25.56 percent in 2017 compared to that of 2016. However, the report shows that the number of road accidents came down in 2017 compared to 2015. The NCPSRR mentioned nine main reasons for the accidents and casualties. Those are reckless driving, plying of three wheeler-vehicles and motorbike, carrying passengers and goods in locally-made mechanised small vehicles, overloading and overtaking violating laws, not following traffic rules and regulation properly on long routes, long-time driving without break, huge risky turning points and dilapidated roads, non-enforcement of law to stop plying of unfit vehicles and finally and employing unskilled drivers. 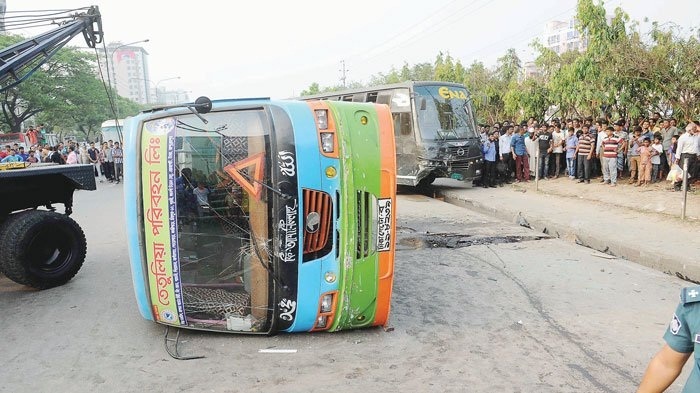 Ashis Kumar Dey, general secretary of the national committee, said lack of proper supervision and people’s awareness were the major reasons behind the high number of road crashes.